TODAY for as Little as $15.00! Get your name noticed in our nationwide directory today and increase your signings and income. California Association of Notaries makes it easy for banks, credit unions, mortgage companies, title & escrow, closing companies and signing companies to find and contact you directly. Gain more exposure without breaking the bank. Let California Association of Notaries market your business to targeted customers. With the California Association of Notaries (CAN) Membership Program, we partner with you to provide the expertise you need to earn the $$$ you deserve. After your name is listed in the California Notary Directory, we will promote your signing business to various companies looking to hire notaries in California. The California Notary Directory will help to assist you in building your notary signing agent business immediately. Let California Association of Notaries Do The Work For You! Our mobile notary and loan-signing agent database provides full assistance for all your notary signing needs. We provide a complete guide to locate a notary public in your area. Our goal is to provide the "Best of the Best”. The California Association of Notaries loan signing agent and notary mortgage signing services database was created to assist those who are in need of professional and experienced notaries. Signup free and start searching today - leave the hard work to us! 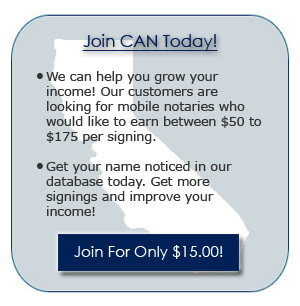 California Association of Notaries is a directory of mobile notaries and loan signing agents. 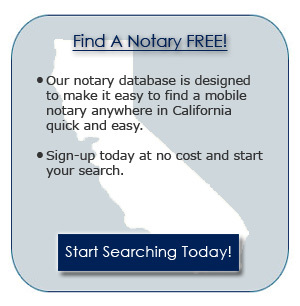 Our notary database is designed to easily find mobile notary, public notaries or loan signing agents anywhere in California.